Dri-Dek is a 12”x12”x9/16” interlocking square made from virgin Oxy-B1 polyvinyl chloride that is flame and chemical resistant. 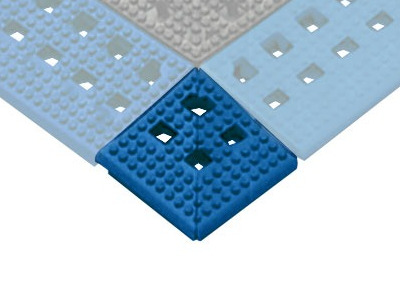 Each square has a knobby, perforated surface with the brand name Dri-Dek in two corners. 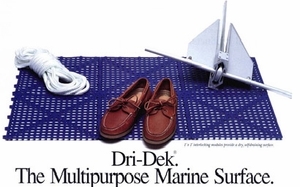 Dri-Dek has a ventilated surface protects your boat - keeping stowed gear dry and free from mildew and musty odors. It’s ideal for lining compartments, cabinets or lockers. Use it beneath cushions and bedding too. Dri-Dek works like a shield. Put it beneath anchors, line, tools or any loose equipment for a shock absorbing dry surface. Protects both wood and fiberglass from impact and abrasion damage. Solve the problems of marine and boat carpet by replacing it with Dri-Dek. Just snap the 1’ x 1’ modules together to cover an area of any size or shape. For a custom fit, just trim to fit. Dri-Dek is the best boat equipment decision you’ll ever make.